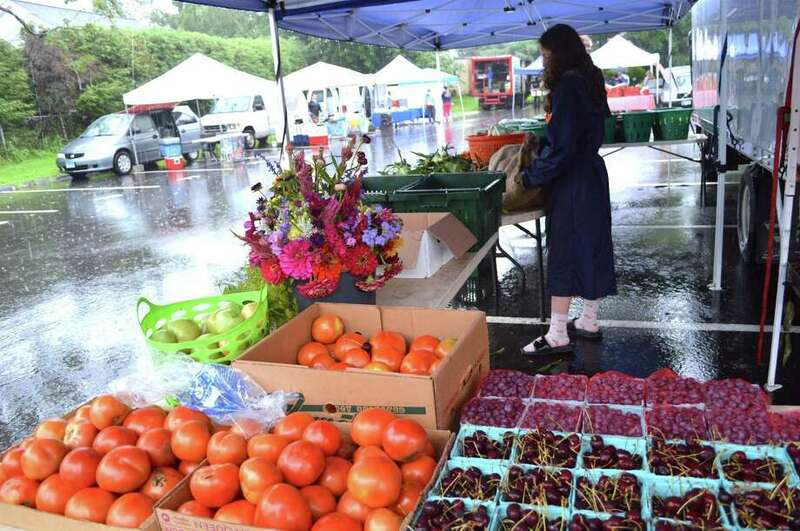 Alexandra Koletsos of Gazy Bros. Farm in Oxford gets things ready in the rain for the start of the sale at the weekly New Canaan Farmers' Market, Saturday, Aug. 11, 2018, in New Canaan, Conn.
NEW CANAAN — And the rain, rain, rain came down, down, down, but the vendors kept on selling. Saturday’s weekly Farmers’ Market was a damp affair, but participants muddled through with as much sunshiny spirit as they could muster. “You get rainy day customers,” said Dominic Gazy, fourth generation farmer with Gazy Bros. Farm in Oxford, which is celebrating its 100th year in continuous operation. While business will likely be half of what it is on a clear day, Gazy chooses to look at the glass as half full. “It’s better than nothing,” he said. Fortunately, too, some customers brought positive attitudes to the market as well.